Journaling: Van, You were very hard to buy for this year. I went shopping with your Mom and Nev. At Target we found a very soft, fuzzy throw for you. Later I found the fuzzy pillow. Papa and I also gave you a root beer making kit. I found a 6 pack of root beer and hung money over each section. Papa and I also gave you money to play the online game you like. Papers are all Echo Park except the green plaid. That is a much older Bo Bunny paper. Die cuts on top are made with the Silhouette. Bottom die cuts from one of my Gran friends on Rockin' Scrappin' Grans. There is nothing better than a nice cozy blanket and pillow. Well he likes the throw!!!! what a sweet smile!---The root beer journaling reminded me that it was my favorite soda when I was a kid! Nicely done! Beautiful Christmas page. 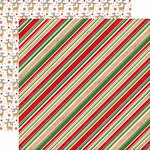 Love the mix of patterned papers! Such a cute photo & the colors are so pretty. Great page. What awesome embellies, esp the title! I love his "snuggling" photo too! It's so true, as they get older they become harder to buy for. I found this to be true with my niece (now 18) and nephew (now 15). I've resorted to creative monetary gifts. I've done the bills taped together in a tissue box, made a money pizza once, hanging Christmas trees and origami flying butterflies, LOL Anyway, this is a great Christmas page! 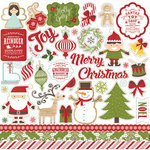 Love the red and white and the pretty white die cuts! Wonderful page page and photo! Love the embellies. Wonderful seasonal lo. Great photo and journaling. Your design and embellie placement is wonderful on this. Your dgd is so handsome! That is an awesome layout! Love the papers you used! wonderful. 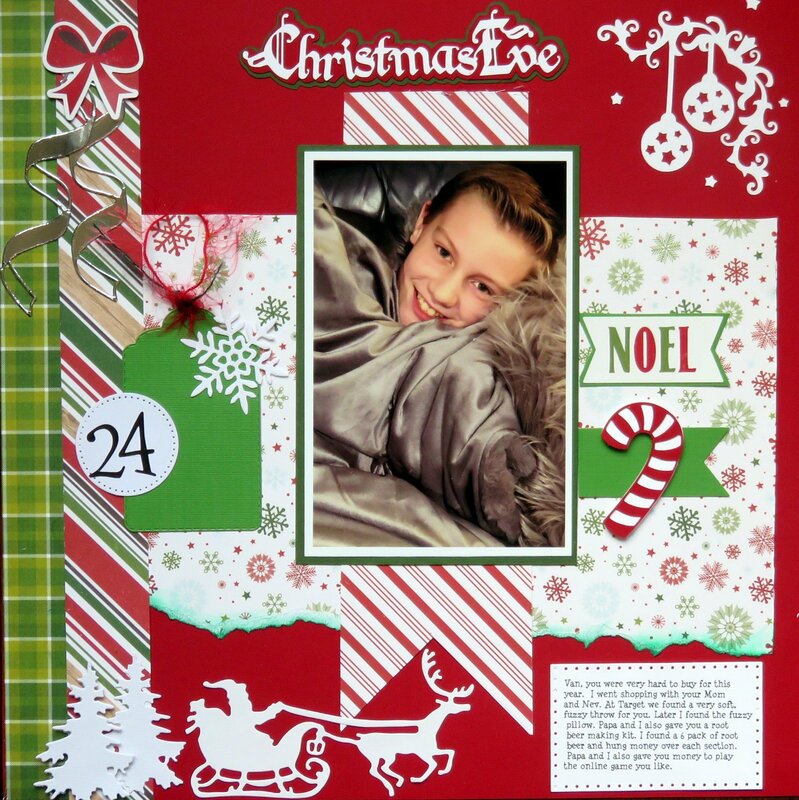 Christmas is my favorite layouts... he's a cutie, and I especially love how you're telling him the story. Love you layering and the different techniques you used, ie inking and tearing. Great dies chosen!!! Love the pic of Van, what a handsome young man! You really are good at journaling! This is such a nice LO. I love the Christmas papers and the die cuts and the way you arranged them. Your grandson is a handsome young man! Great LO ! Love the pps and embellishments! I like the journaling block- You are so good at journaling.